(http://www.chrisstuart.com). She has toured extensively with CS&B throughout the United States, Canada, the United Kingdom, Europe, and the Middle East. 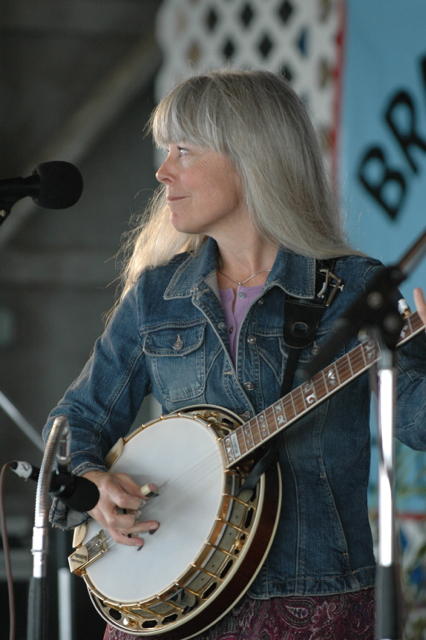 Janet has taught bluegrass banjo, harmony singing, music theory and song writing at many workshops, including Rivertunes, Midwest Banjo Camp, American Banjo Camp, Suwannee Banjo Camp, Augusta Heritage Center Bluegrass Week, California Bluegrass Association Bluegrass Week, Banjo Camp North, Munich Banjo Camp, and Sore Fingers Week in the UK. Janet also plays and teaches classical music and holds a doctorate in Early Music from USC. She directs the Collegium Musicum (early music ensemble) and the Bluegrass Ensemble at UC Riverside. She is a sought-after clinician at early music and recorder workshops here in the West. Janet teaches bluegrass banjo to students of all levels. She also teaches traditional and baroque flutes, recorders and whistles, beginning mandolin, beginning dobro, as well as viola da gamba. Below are the lessons openings for Janet Beazley. Please find a time below and click the "register" button to sign up for a class. Would you like more information on Emmanuel Sanchez's lessons, policies or procedures? Fill out the contact form below and Allison will contact you with more details. No obligation is made when filling out the contact form.